Now a movement is a term given to a section of music within a larger piece of music, normally self-contained and separated by silence in any other genre that’s a track or song. Most of my music is not classical and I guess that is the case for may others so the “Grouping” field goes unused. The conclusion I came to was the tag could be used in a lot of different ways — movements within a classical composition were the intended use, but are probably not the most common. Some useful fields are missing form the current tags in iTunes (8.1.1) and the “Grouping” tag could be used for are Record Label, Parental Advisory (Explicit Lyrics), Sub Genre, Licence and so forth. 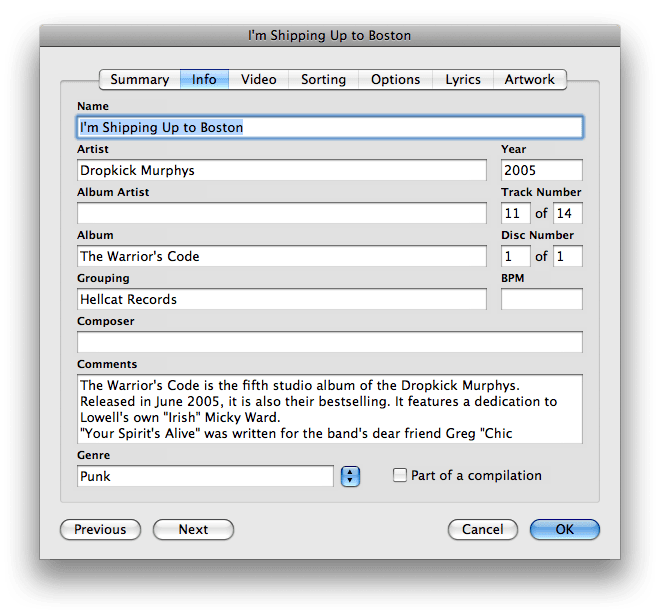 The above shows an example of the Get Info dialog box for the Dropkick Murphys track “I’m Shipping Up to Boston” in Apple iTunes 8.2. What I settled on was to use the “Grouping” tag for the Record Label as this is something I would like to be able to sort music by at times. I am sure this is not the best solution for everyone and would discourage people from using the field incorrectly when adding tags to CD’s uploaded to Gracenote for instance but it works for me and the way I use iTunes. How do you use the ‘Grouping’ field? Let me know. Thank you for this! I just noticed it—yeah, late to the party again—and I think I’ll duplicate the artist info here so the damn shuffle will mix it up better. There really ought to be an Artist option in Shuffle, I think. Anyway, thank you for this. Or, ever notice AMG Allmusic Guide describes albums by moods as well, in addition to genres? e.g. “bleak, gloomy, clinical, detached” for Radiohead’s Kid A, “hostile, epic, fierce, suffocating” for Metallica’s Master of Puppets? The grouping tag is where I put these musical moods. From there I can allow smart playlists pick music that’s “confrontational, stylish, malevolent” for me. But really, the grouping tag is such a wild card that one should use it to their liking.